Don't get me wrong, I love the holidays but end up getting sick and this year is no different. Ugh. I've just been so out of it, I'm usually crawling into bed long about 8pm, totally wiped out. So please accept my apologies for being an absent blogger. Last week, when I feeling great, I made my friend Sonie a special chocolate treat for her birthday. These brownies were the ultimate in chocolate decadence, courtesy of Dorie Greenspan. Honestly, it was almost a cross between a brownie and chocolate fudge! It was insane, really. I had a little bite and it actually gave me a little buzz! If you're looking to knock the socks off a chocolate lover in your life, you cannot beat these brownies. If you decide to make them, don't skimp on the ingredients. Get yourself some really good chocolate. I used Baker's for the unsweetened, but went all out for the cocoa (Droste), semi-sweet, milk, and white chocolates: I used Guittard for everything. I know its pricey but I think it really makes a difference. If you have to cut back, then I'd hold out for the good white chocolate and skip the waxy white chip in the baking isle. Instead, head down to the candy isle and look for two 3oz bars of Lindt. I ended up doubling the recipe and making it in a 9x13 pan. I do not recommend this! My brownies came out a bit soft in the center and they actually broke in half when I cooled them off. No one complained because they were super duper fudge, but trust me, just stick to making the recipe in a 9"x9" pan. Center a rack in the oven, and preheat the oven to 325F. Line a 9-inch baking pan with foil, butter the foil and place the pan on a baking sheet. Sift together the flour, cocoa and salt, set aside. Set a heatproof bowl over a saucepan of simmering water and add, in the following order, the butter, the two chocolates and the coffee. Keeping the pan over low heat, warm just until the butter and chocolates are melted- you don't want the ingredients to get so hot they separate, so keep an eye on the bowl. Stir gently, and when the mixture is smooth, set it aside for 5 minutes. Using a whisk or a rubber spatula, beat the sugar into the chocolate mixture. 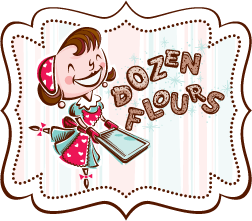 Don't beat too vigorously- you don't want to add air to the batter- and don't be concerned about any graininess. Next, stir in the eggs one at a time, followed by the vanilla. You should have a smooth, glossy batter. If you're not already using a rubber spatula, switch to one now and gently stir in the dry ingredients, mixing only until they are incorporated. Finally, stir in the milk chocolate chips and the nuts. Scrape the batter into the pan. Bake for about 35 minutes, or until a thin knife inserted into the center comes out streaked but not thickly coated. Transfer the pan to a cooling rack and let the brownies rest undisturbed for at least 30 minutes or longer. Turn the brownies out onto a rack, peel away the foil and place it under another rack- it will be the drip catcher for the glaze. Invert the brownies onto the rack and let cool completely. Hold a long icing spatula in one hand and the bowl of glaze in the other. 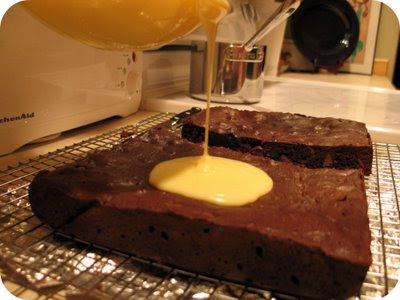 Pour the glaze onto the center of the brownies and use the spatula to nudge it evenly over the surface. Don't worry if it dribbles over the edges, you can trim the sides later (or not). Refrigerate the brownies for at least 30 minutes, or until the glaze is firm. Cut into square in your desired shape. 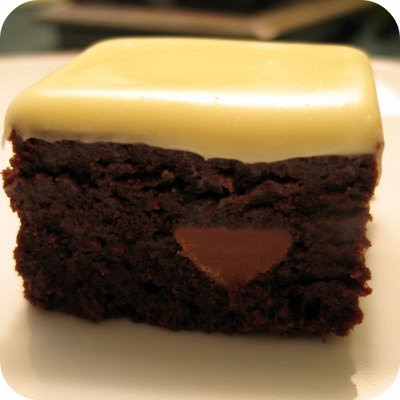 Be sure to clean off the knife after each cut so you don't get gooey chocolate brownie all over your pretty white chocolate glaze. Wow, these look amazing! You couldn't clarify the chocolate for me, could you? Just we have different names for them in England. Is the bittersweet a good 70% coco chocolate and is the unsweetened just cooking chocolate? Holidays and being sick just don't mix- but they never stop trying! These look so mouthwatering! Yum, these look delicious! I love your blog - my mother in-law, Dominica Degrandis sent me your blog last week and I already happened to subscribe to it on my RSS feed. Dominica is lucky to work with such a talented baker! Julia, hey lady! Sorry to hear you are under the weather. Hope you're on the mend soon! I love reading your post! They always make me smile. I promise not to try doubling the recipe! LOL! Love, love, love the photo of you pouring on the glaze! These look incredible, can't wait to try them out! These were the best brownies i ever had.... gr8 job!!! Julia, I hope you're feeling better by now. These brownies are really over the top - I don't know how you come up with these combinations. I need to find a big group of people to eat these so I can try them wihtout making myself sick.